Great opportunity to buy an established Valpak franchise in North Carolina. This Valpak franchise in The Triad – Greensboro, Winston Salem, NC covers the territory of Alamance, Davidson, Davie, Forsyth, Guilford, Randolph and Yadkin Counties. The asking price includes the Franchise and Training fee of $15,000 which includes New Franchise Owner Training, VPOffice® Training, attendance to 1st Coupon U annual conference, New Franchise Owner Kit, Ongoing consultation with Sales Coach and miscellaneous first year training and support. In addition $25,000 of initial investment will be credited back in the form of plant bill credits after 12 consecutive months of on-time payments.This business currently mails 120,000 out of potential 320,000 prime house holds. showing a huge potential that can be achieved by the new buyer. 3rd party financing options available. 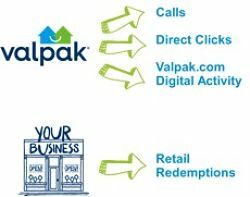 Valpak Direct Marketing Systems, Inc. is North America’s largest direct marketing company in the U.S. and Canada, Valpak provides businesses with print and digital advertising solutions helping people save, businesses grow and neighborhoods thrive. Valpak marketing consultants Own the Neighborhood!™ as they live and work in their neighborhood. We know what customers want and can help take the guesswork out of advertising with real-world marketing solutions that drive measureable results. From the mailbox to online to mobile devices, Valpak continues to find innovative ways to connect business with consumers. Monthly, close to 40 million homes receive our Blue Envelope of savings and traffic on valpak.com and our syndication partner sites exceeds 110 million. We offer powerful tracking and reporting tools to demonstrate ROI, robust business support tools and comprehensive training programs. We know that our success is directly connected to yours! Valpak is the most recognized coupon brand in North America founded in 1968 and started franchising in 1986. There are 131 franchised units and 14 company owned units in the network. Valpak has 92% brand awareness, mails more than 500 million envelopes/20 billion coupons a year to nearly 39 million prime households in North America. Valpak offers a Veteran discount and is on the SBA registry. To find out more about this Valpak franchise business for sale, please fill out the form below and submit. San Diego - California - $0 SOLD! Greater Houston - Texas - $0 SOLD!